"Prayer should be the key of the day and the lock of the night". "Morning prayer is an important element in the spiritual creation of each day and precedes the Temporal Creation or actual execution of the day." 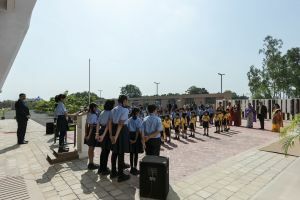 Morning assembly is a tradition, a ritual which is religiously followed at RKSVA. Morning Assembly is one of the most important event of the day in the school as a part of legacy on move. The Assembly at RKSVA not only aims to mark it as a first step towards team work for some and leadership for a few but they are also the build-up for the initial source of character development and discipline inculcation for a healthy mind and life. The students perform prayer, perform PT/Drill, deliver speech, read out excerpts from different themes, hear some very interesting thoughts and experiences of their teachers, understand a responsibility towards their country and fellow citizens by taking a pledge, etc. Dispersal of Assembly takes place with the singing of National Anthem stregthening the nationalist feelings of being Indians.